Most children can be ‘faddy’ eaters at some point whilst they are growing up and this is no different for children at a day nursery. For children who have been used to being at home full-time, starting nursery can be a daunting affair and mealtimes may seem very strange at first. 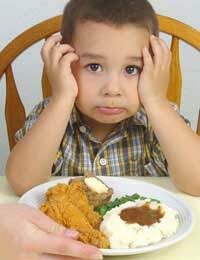 A child who is already coping with separation anxiety, may find that eating with other children, or being presented with unfamiliar foods, can be too much to cope with. If a child is new to the nursery, staff should remember to pay attention to how and what they eat (often recorded in a diary for the parents) and note whether the child seems unsettled. If they do, then a known nursery nurse should gently come alongside the child and encourage him or her to eat. If this doesn’t work and the child doesn’t want to eat anything, don’t force them, but make a note of it. If a child does not begin to enjoy mealtimes at nursery ask the child when they are away from the table, and in an ‘unthreatening’ area, what kinds of foods they like to eat at home and what their idea of a ‘favourite’ mealtime might be. This could be as part of a wider group discussion, so as not to alarm the non-eater. Ask whether they like the food at nursery and if they say ‘yes’, at the next mealtime, try to present the food in very small ‘bite-sized’ portions, so that they don’t feel too overwhelmed. Incentives such as a story or a sticker might be suggested if they manage to eat a little bit but it is important not to increase pressure of make them feel a failure if they can’t do it. Some children may be used to a parent sitting down and helping them to eat and might feel daunted at the idea of fending for themselves so suddenly. In this case, a helper should be assigned to the child and until they learn to be more independent, should help him or her feed. At first, simple rhymes and games can be introduced to distract the child and help them realise that mealtimes can be fun, and then as they are reassured, they can graduate to being in control. If a child does not wish to eat and their refusal has been going on for more than a day or two, it is important to make sure that the parents are informed. By speaking to those that know the child best, it can be quickly established whether or not the parents are experiencing similar difficulties at home and if its just the food which is at issue, or if it could be representative of some other problem. Nursery staff must work with the parents or guardian of the child to evolve a strategy which can be maintained both at nursery and at home to help the child feel comfortable at mealtimes. If the child is used to different foodstuffs at home, it may be an idea for the family to prepare some food to bring in, so that the child is having something familiar for snacks and lunch. Sometimes a child will learn that if a fuss is made at mealtimes, they will be given more attention. It is important to establish whether there is a real problem, or whether the child is ‘playing games’ – either consciously or unconsciously. By noting whether it is always a particular foodstuff that is refused, or if there is no exact pattern, can help ascertain how consistent the likes and dislikes actually are. Above all, the child’s emotional well-being is of paramount importance. Mealtimes should never become a battleground and if there is some anxiety about food or eating for the child, constant persuasion to eat against their will, may only serve to make things worse. Most children will eat when they are hungry and as long as they are eating a healthy amount before and after nursery and drinking during the day, there may not be too much cause for concern in the short term; however, if things do not settle down, then more intervention may be needed. If the child’s refusal to eat is prolonged, the habits are extended to the home environment and not just nursery, and the child’s health seems to be suffering, the parents should always consult their GP for further advice.